Paradox is at Gamescom this week, but it won’t be showing the gameplay reveal trailer for Hearts of Iron IV. Given that it’s a historical strategy game covering World War 2, it’s hard to avoid Nazi iconography or imagery, and they’re not too keen on that in Cologne, as that sort of stuff is banned in Germany. So you’ll just have to be content, watching it on a monitor instead of on a slightly larger screen in Cologne. It’s a right bugger making a game where you spend most of your time looking at maps look exciting. All the intensity of grand strategy is contained in the minds of players and in numbers and treaties and logistics. That’s not very trailer friendly. But there is quite a bit to be excited about. Back in January, Tim, Rob and I got to take a gander at an early build of Hearts of Iron IV, and there was much to get worked up about. I get a bit faint, thinking turning the map into a canvas for my battle plans, drawing great, sweeping lines across entire countries as man and machine move with purpose. I’m positively giddy about the prospect of stealing the enemy’s battle plans, too. Finally, there’s meat on the espionage system’s bones. And it’s all taking place on what is undoubtedly the most gorgeous map Paradox has ever crafted, where there are no map modes, and everything is right at your fingertips. As the sun crosses the sky, the map lights up, and when it sets again, then’s the time for night time raids and midnight bombing runs. That’s not really conveyed by newsreel footage some pictures of maps. It’s a pity. 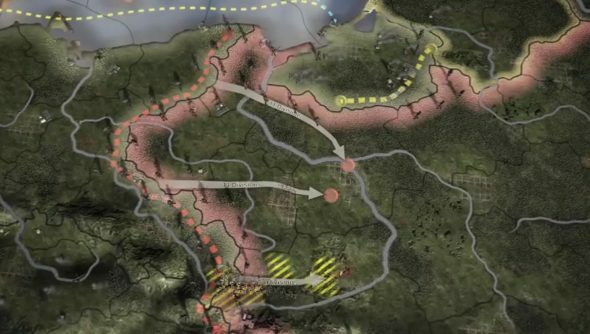 But you can read Rob’s Hearts of Iron IV preview for some reasons to get more than a little pumped.